We have just added command line support to Gmail Keeper – our lightweight and easy Gmail and Google Apps email backup software, this means that you can now start a gmail backup from other programs, or schedule your gmail backup tasks with the system scheduler, or just create a batch file to call Gmail Keeper to start backup your backup profile set up for your Google Apps email account. “profile name”. The profile you want to start backup. /Q. 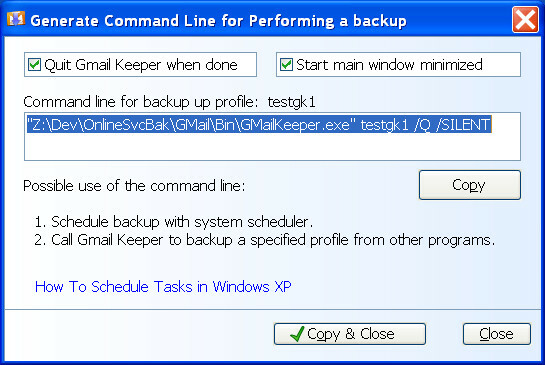 Quit Gmail Keeper once the backup is completed successfully. /SILENT. Don’t show Gmail Keeper main window when starting the program. While the above described command line switch are quite simple and easy, Gmail Keeper makes it even easier by allowing you to generate the command line with a helper window, try right click the desired backup profile and select ‘Generate Command Line’, a window look like the following one will appear, you can setup your options easily and Gmail Keeper will generate the command line for you. Download the latest trial version here. Paid customers can also download their full version, contact us if you don’t’ have the information needed. I’ve create a batch file to back up my stuff to an external disc. At the start of the file I’ve placed the appropriate Gmail Keeper command line (because I want Gmail Keeper to make its zip file and then I want to backup the zip file to the external disc). BUT – the Gmail Keeper command line kicks off the process and than the rest of my batch file starts to process before Gmail Keeper has completed. How can I make the rest of my batch file WAIT until the Gmail Keeper process has completed successfully?? @Rob, not sure how to wait for a process to stop in a batch file. Sorry. i hope that it assists because it helps me alot.. ..and occasionally even when i have writers block and i’m performing some thing else to take my mind off of my composing, i come across a time when i Wish to create much more of my story basically because i guess my writerâ€™s block is cured, so occasionally the correct time comes to you, i guess sometimes all u need to do is wait.. …i know i dont make sence but try obtaining watever u can from my answer and see if it works!! This really is a good subject to talk about. Sometimes I fav stuff like this on Redit. This post probably wont do properly with that crowd. I will probably be positive to submit something else though. Howdy! This arficle c?uld not be ?ritten m?ch b?tter! This really is a good subject to talk about. Sometimes I fav stuff like this on Redit.